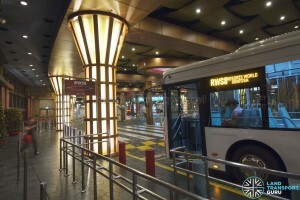 Resorts World Sentosa is an integrated resort on the island of Sentosa. 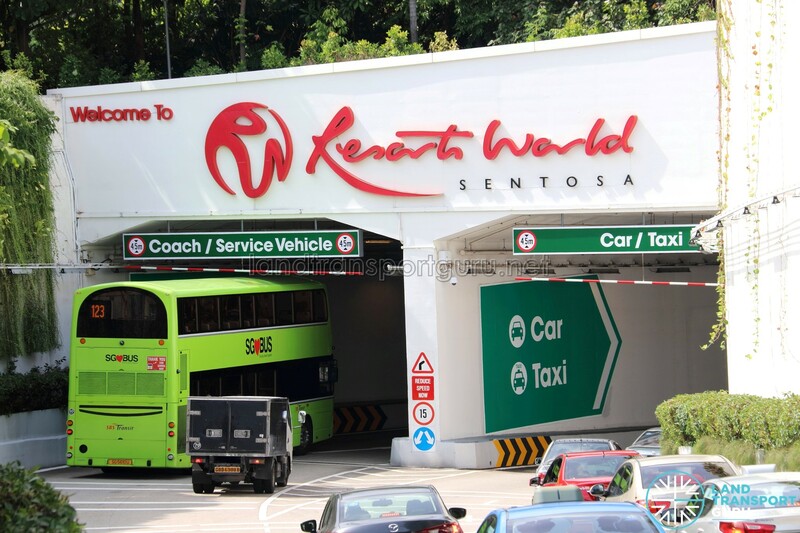 Within its sprawling basement carpark, a collection of parking facilities for buses and coaches, as well as passenger pick-up/drop-off points, cater to bus services that operate to and from Resorts World Sentosa in which we will collectively term Resorts World Sentosa (Bus Terminal). 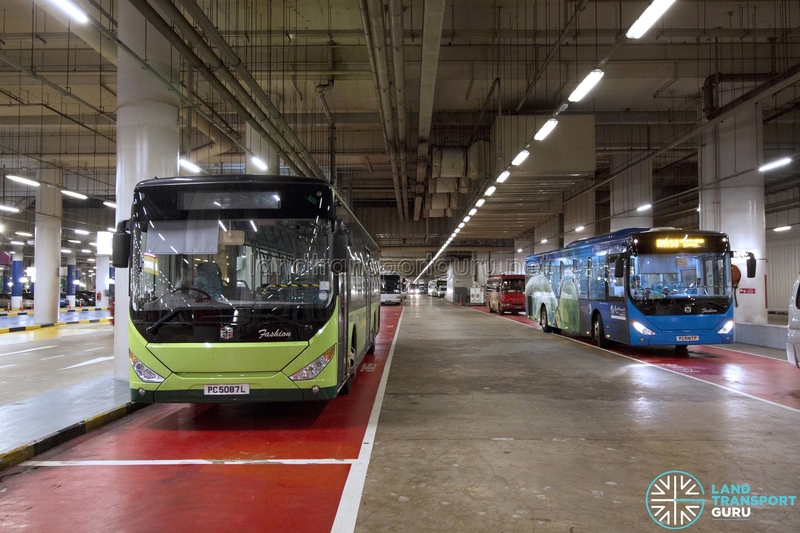 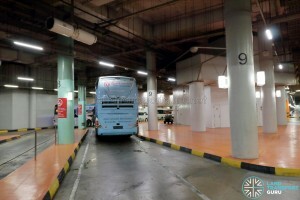 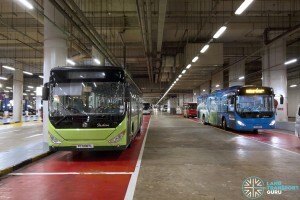 Opened in 2010 along with the Resorts World Sentosa Integrated Resort, the basement carpark contains several bus facilities, such as a Bus Park, a Boarding and Alighting Point, and a Coach Bay. 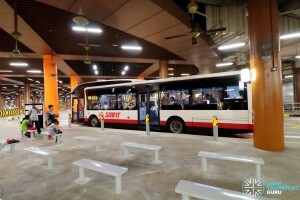 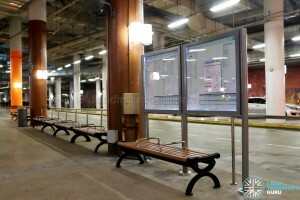 In bus route information, buses which call at Resorts World Sentosa simply pick-up and drop-off passengers at the designated passenger berths within the basement carpark, with no mention of the bus terminal. 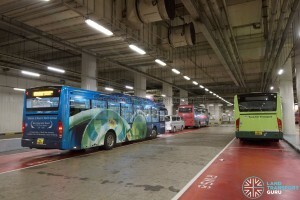 In practice, buses park at the Bus Park for layovers. 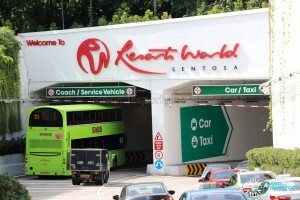 Resorts World Sentosa is served by RWS8, a daily shuttle service to HarbourFront, as well as Sentosa Internal Bus route A. TS8 and other ad-hoc services operate to Johor Bahru. 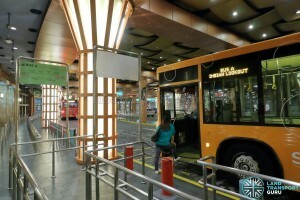 In addition, there are four public bus services which only operate on Weekends & Public Holidays. 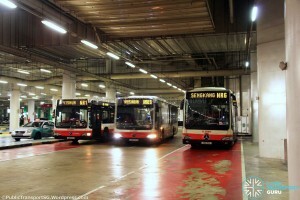 Express services 188R and 963R operate in the day, heading to Choa Chu Kang and Woodlands respectively. 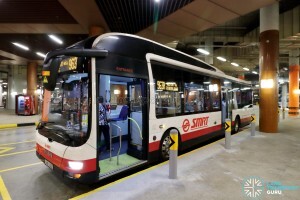 NightRider services NR1 and NR6 head via the City to Yishun and Sengkang respectively, and passengers using Ez-Link cards can make one free transfer to other NightRider routes in the City, extending the late-night bus coverage to many areas of Singapore. 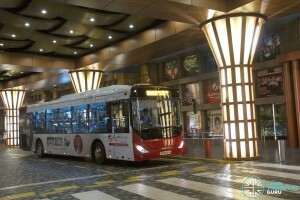 Public Bus Service 123 serves Resorts World Sentosa daily, but only towards Beach Station. 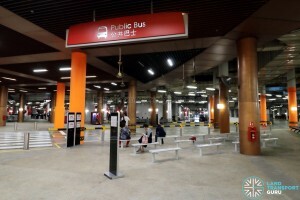 The Bus Park occupies a part of the coach park, using red-painted parallel parking lots reserved for Tong Tar buses (operating on RWS8) and SMRT Buses. 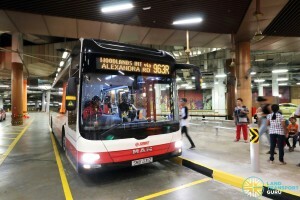 Because of the unidirectional traffic flow pattern within the underground complex, terminating buses must make a large round around from the passenger alighting point to the bus park. 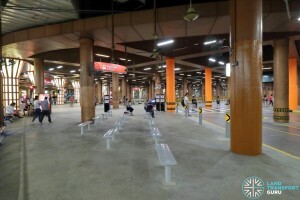 Within the bus park, there is a dispatch office (occupied by Tong Tar, formerly used by SMRT Buses), toilets, vending machines, and benches for resting bus drivers. 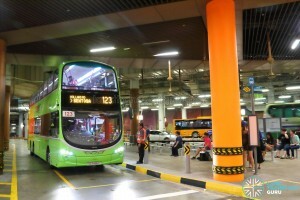 Boarding and alighting activities for Public Bus Services 123, 188R, 963R, NR1 and NR6 are located at a pick-up point outside the Forum, complete with waiting lanes. 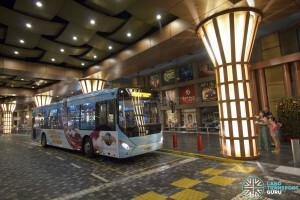 Passengers exiting from the forum must take the pedestrian crossing to reach the pick-up point. 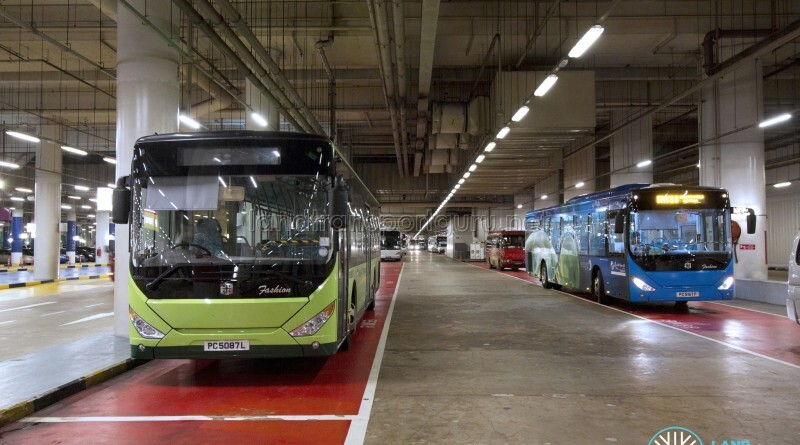 Sentosa Bus routes 1 & 2 and RWS8 have a separate boarding and alighting point area nearer to the Convention Center due to ease of boarding and high passenger demand. 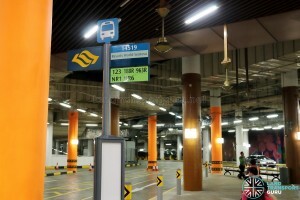 A separate Boarding / Alighting point is designated for the Genting Hotel Shuttle near the Car Park. 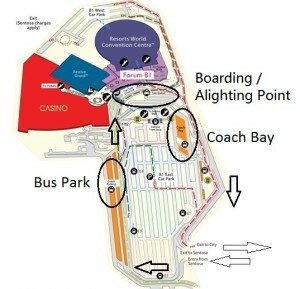 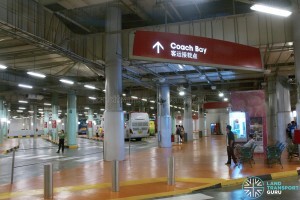 The Coach Bay contains waiting lanes for passenger boarding/alighting and short layovers for coaches. 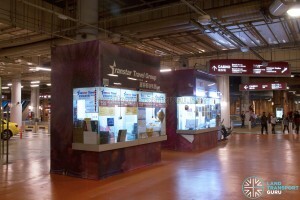 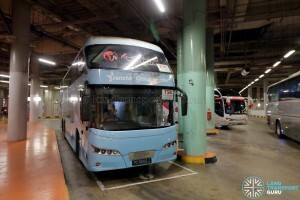 It is also the boarding and alighting point for Transtar Cross Border Bus Service TS8, which offers regular services to Johor Bahru, as well as irregular services offered by the 707 Travel Group. 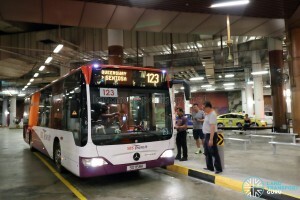 LTA should amend service 123 to call this ter towards bt merah int, calling at this ter in both direction.